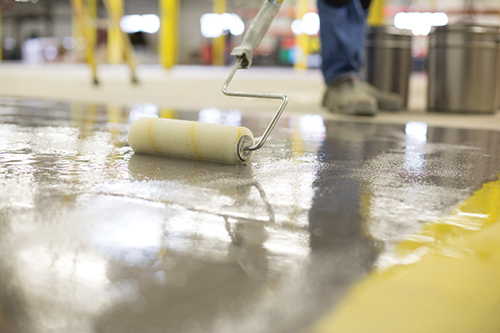 A Kansas City, MO-based coatings manufacturer has launched a two-component, clear epoxy primer designed to offer superior penetration and adhesion to concrete. Series 208 Epoxoprime MVT, made by Tnemec Company Inc., is a moisture vapor-tolerant, high solids epoxy primer for newly poured and existing concrete slabs. According to Joe Schmit, director of the StrataShield flooring division, the primer is specially formulated to resist high pH and help protect the bond line between the floor topping system and the concrete surface. Tnemec’s Series 208 Epoxoprime MVT is a two-component, high solids clear epoxy primer that reportedly helps to reduce moisture from escaping new and existing concrete surfaces where elevated moisture vapor transmission levels are of concern, the company says. Schmit notes that even when concrete is at full strength and fully cured it remains porous, so moisture vapor transfer and high alkalinity may still be a concern. Applied at 16.0 to 20.0 mils dry film thickness (DFT), the primer reportedly penetrates the concrete surface to provide "excellent" adhesion and "ultra-low" permeability, helping to reduce moisture from escaping new and existing concrete surfaces where elevated moisture vapor transmission (MVT) levels are of concern. Series 208 can be applied as early as 10 days after newly placed concrete is installed instead of the standard cure time of 28 days for other primers, the manufacturer says. Following application, the product can be topcoated after six to eight hours of cure time at ambient temperatures, the company notes. The 100 percent solids primer is said to conform to the volatile organic compound (VOC) requirements of every air district in the U.S., and its low odor enables its use in occupied areas, making it ideal for fast-track projects where sustainability is a consideration, according to Tnemec. The company states that its primer withstands MVT up to 15 pounds in accordance with ASTM F1869 Standard Test Method for Measuring Moisture Vapor Emission Rate of Concrete Subfloor Using Anhydrous Calcium Chloride. It also reportedly withstands relative humidity up to 95 percent in accordance with ASTM F2170 Standard Test Method for Determining Relative Humidity in Concrete Floor Slabs Using in situ Probes. The primer also offers excellent resistance to high alkalinity levels up to pH 14, the company adds.